Long before the ideas of staging one’s home for sale or Andy Warhol put his finger on the concept of “15 minutes of Fame,” the theatrically inclined used public parks as backdrops to act out life’s important events. Think Easter egg hunts, picnics in white, carriage rides and romantic ice skating trysts on artificial ponds. Think late 19th Century America and the design of public parks as a place to showcase social conventions and values. In Melodramatic Landscapes Heath Schenker, landscape design professor at UC Davis, presents a study of the design and use of public parks in Paris, New York and Mexico that highlights the social constructions and cultural expressions, pretensions and aspirations found in the settings of Victorian Era public parks. Schenker looks at parks as so much more than trees and grass. She sees them as public theater spaces where Americans continue to play out their lives. Daniel Nadenicek, landscape historian and dean of the College of Environment and Design, University of Georgia, says Schenker’s Melodramatic Landscapes will “serve as a guiding light for new scholarship on the history of landscape architecture.” Schenker’s work makes the case for a new understanding of parks as a stage for public life. And, she suggests we need to find renewal in public parks—historical, contemporary—for the staging of today’s various competing publics. Christo’s Gates in 2005 Central Park is a modern example of setting the dramatic in the context of a naturalistic public landscape. Christo’s installation subtly got at the origins and motives of large public parks. But there are other dramatic modern uses, from rock concerts to skate boarding competitions. 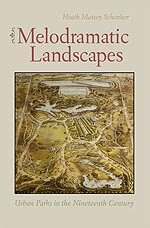 Melodramatic Landscapes shows us how these public spaces were conceived, what social role they played then and provides a context for consider how they might be transformed now to meet changing social values. Drawing on a wealth of historical sources, including original plans and drawings, descriptions in guidebooks, newspaper articles, and even representations in novels, Schenker reveals how civic leaders adapted the park ideal to serve their particular political, social, and economic agendas. The narrative boasts a number of first-person accounts by nineteenth-century visitors, populating the picturesque scenery with a lively cast of characters worthy of the age of melodrama.